Lush Fab Glam Inspired Lifestyle For The Modern Woman: Style Steal: Look As Fabulous As The Stars At The 2013 Golden Globes. Style Steal: Look As Fabulous As The Stars At The 2013 Golden Globes. The 2013 Golden Globe Awards brought out the who's-who of the Hollywood and TV entertainment industries in their glamorous designer dresses, accessorized with statement earrings, necklaces and bracelets. We especially loved Salma Hayek's bold turquoise earrings and Lea Michelle's vibrant and colorful emerald green bracelet. 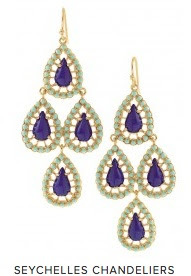 Stella & Dot's beautiful teardrop Seychelles Chandelier Earrings feature bold lapis stones and hand-painted turquoise enamel. 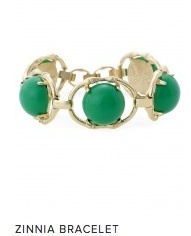 The Zinnia Bracelet is perfect for spring. The emerald green cabochon stones that line the vintage-inspired bamboo link bracelet will add a vibrant pop of color to any outfit. 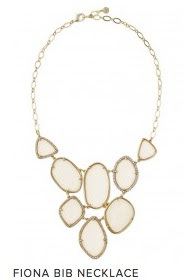 The luxurious Fiona Bib Necklace was designed with segments of luminous ivory that create a crisp, modern look that will keep all eyes on you. Don't miss your chance to shop this great new collection from Stella & Dot.